Hidalgo County Assistant Criminal District Attorney Joseph Orendain gives the state's opening arguments in the capital murder trial of Monica Melissa Patterson Monday Sept. 25, 2017 in the 370th District Court in Edinburg. EDINBURG — Surrounded by high-profile attorneys, Monica Melissa Patterson appeared confident during the first day of trial Monday, when she entered a plea of not guilty in the capital murder of a 96-year-old man. Other charges in the case she faces include two counts of theft and misapplication of a fiduciary. Her team of four lawyers declined to give an opening statement, opting to do so at a later time. 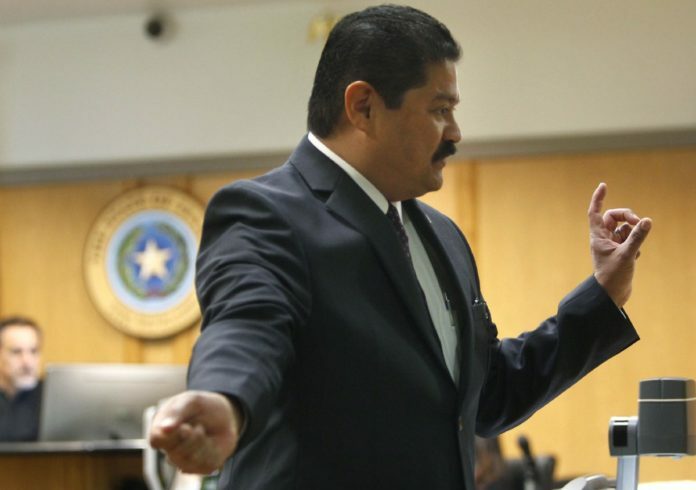 By contrast, Hidalgo County Assistant Criminal District Attorney Joseph Orendain spent nearly an hour painting a picture of the events leading up to the death of Martin Knell Sr. on Jan. 28, 2015. Patterson, 50, first met Knell in September 2014 after he admitted his wife, Thelma “Penny” Knell, to McAllen’s Comfort House Services Inc., the palliative care facility where Patterson served as executive administrator since early that year. Within a week of meeting, Patterson went from calling the police on Knell after he first tried to visit his wife at Comfort House to accompanying him to his bank to inquire about the balance of his account, Orendain told the jurors. After learning that Knell was considerably wealthy, her treatment of him changed “completely,” Orendain argued. Orendain then told jurors Patterson “fed and encouraged” the 95-year-old’s “mistaken” belief that his son, Martin Knell Jr., was after his money. The prosecutor went on to argue that Patterson had convinced Knell to add her name to his stocks and made her executive beneficiary of his will within three months of their first meeting. Patterson became a payee of his bank account before his death in January 2015, Orendain further argued. After becoming emotional upon describing the victim’s final morning, Orendain detailed the circumstances surrounding Knell’s death, noting that Patterson arrived at his house that day with Mario Angel Garza, 39, and that sounds of a struggle were heard at one point. Following his death, Orendain said Patterson emptied Knell’s bank account and filed his will on Feb. 9 and Feb. 16, respectively. Whereas most of the prosecution’s opening statement focused on these events, witness testimony revolved around accusations of mismanagement and abuse of Comfort House funds. Orendain told jurors that Patterson allegedly stole more than $100,000 from the facility, using $25,000 to throw her son a “lavish” high school graduation party. The two witnesses called to the stand included a former Comfort House employee tasked with overseeing the financials, and Omar Guevara, the facility’s former board president. In addition, the employee alleged that Patterson claimed to be connected with Weslaco police. Guevara alleged that Patterson did not provide the board with the facility’s bank statements, telling them that the accounting software QuickBooks was down. After Patterson’s August 2015 arrest, Guevara and the board performed an internal audit, during which he said they found Ziploc bags of receipts in her office that were for “personal expenses.” These expenses, Guevara said, were not authorized by the board and included flights to Las Vegas, meals at restaurants and Planet Fitness membership, to name a few. Ricardo Salinas, one of Patterson’s attorneys, took issue with the list of expenses Guevara compiled, informing Judge Noe Gonzalez that the defense had never received a physical copy of these receipts. “We know that (discovery issues) may come up in this case because there are so many documents,” Gonzalez said with regard to the receipts. Guevara is expected to return to the witness stand Tuesday.